Originally published in Embassy August 26, 2014. Guest Blog by Roy Culpepper. Much has been said, in this centenary year, about the First World War. The print and electronic media have offered up a surfeit of op-eds, documentaries, reminiscences and analyses of the war and its innumerable consequences for the world down to our own day. In fact, since 1918, at least 25,000 books and articles have been written on the so-called Great War. Can there be anything left to say? Actually, there is, particularly since we need to learn more from the First World War, a senseless conflict that was almost guaranteed to end in stalemate. Yet it killed over nine million and injured more than 22 million. This horrendous toll was heightened by a number of deadly innovations in the technology of war: poison gas, submarines, tanks, warplanes, and long-range artillery among others. In addition, the war laid the foundations for a century of instability in the territories of the collapsing Ottoman, Russian and Austro-Hungarian empires. Hence, it is certainly worth learning more from the First World War and its legacy—about how senseless armed conflict can be prevented, how to strengthen the tools of diplomacy and peacebuilding, how to inhibit the competition for ever more destructive and costly weapons and how to reduce stockpiles of such weapons. In addition, we must learn not only from those who fought in the trenches or from those in command, but also from the perspective of the home front. Women lost husbands, sons and fathers in the conflict. As nurses and caregivers, women also bore witness first-hand to the appalling suffering of combatants. In addition, civil society organizations, conscientious objectors and the advocates for peace all had important roles in resisting the war. But the perspectives of such groups, and of women, were dismissed at the time and continue to be under-represented in mainstream histories. Also, we must learn from the perspectives of former enemy nations. Regrettably, the adage (attributed to Winston Churchill) that “history is written by the victors” retains its validity. Millions of enemy combatants as well as innocent civilians were killed or injured in the First World War. Germany lost around 1.7 million in military deaths, Austria-Hungary lost 1.2 million. It is overdue, a century later, to acknowledge these enormous casualties sustained by the other side. This is beginning to happen, for example, with the project The World Remembers, led by Canadian actor R.H. Thomson. Over the next four years, this unique initiative aims to commemorate every death among the nations on both sides in the war. The fact that truth is the first casualty of war also obscures our understanding of what happened and why. Modern propaganda and censorship took flight in the First World War. We need to peel away the layers of disinformation that cluttered the official record, and also resist their imposition in future conflicts. On the positive side, the First World War led to the creation of the League of Nations. Although it failed to stop the Second World War, the interwar generation accepted that much better international co-operation was imperative to prevent war. This is a lesson we are re-learning with the League’s successor, the United Nations. But as nuclear weapons continue to proliferate, the stakes today are much higher. In the absence of the UN, the world today would look a lot more like it did a century ago, except that a nuclear Armageddon would be infinitely worse. 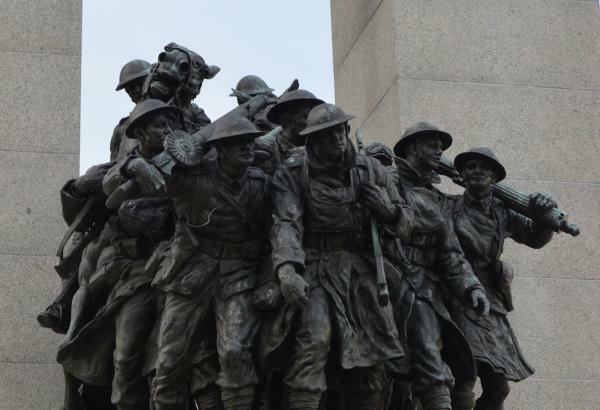 Finally, Canadians need to be more honest about the First World War in our own history. Much has been made about the “birthplace of the nation,” the Battle of Vimy Ridge, in which Canadian troops demonstrated unquestionable valour. But neither was the battle of strategic importance in the war; nor was the war itself a breakthrough in Canada’s march to independence. However, World War I did undoubtedly deepen the divisions between French and English Canada. The lesson for Canadian foreign policy may be that our two solitudes are drawn closer together when diplomacy, peacemaking and international development are its main features. In contrast, war-making in the cause of big-power geopolitics often drives us apart. Roy Culpeper is a member of the Group of 78, a non-governmental organization focused on foreign policy. The Group of 78’s 2014 Annual Conference is on World War I and Contemporary Policy on War and Peace. It will be held Sept. 26 to 28 at the Canadian War Museum. For further information visit the Group of 78 website.